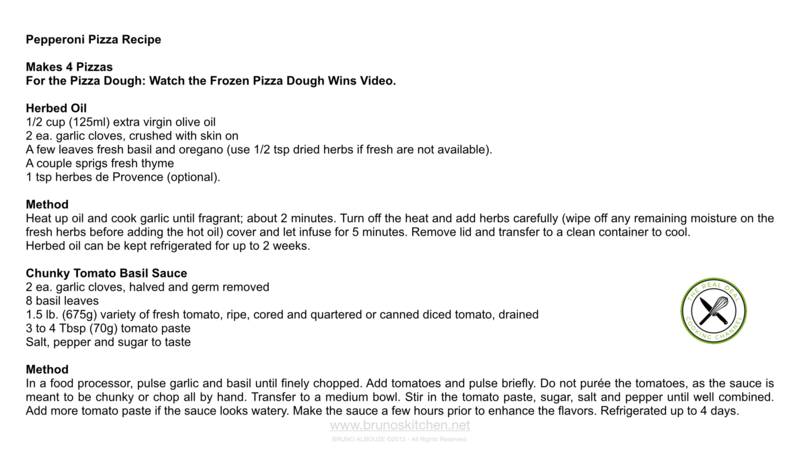 For the Pizza Dough: Watch the Frozen Pizza Dough Wins Video. A few leaves fresh basil and oregano (use 1/2 tsp dried herbs if fresh are not available). 1 tsp herbes de Provence (optional). Heat up oil and cook garlic until fragrant; about 2 minutes. Turn off the heat and add herbs carefully (wipe off any remaining moisture on the fresh herbs before adding the hot oil) cover and let infuse for 5 minutes. Remove lid and transfer to a clean container to cool. Herbed oil can be kept refrigerated for up to 2 weeks. In a food processor, pulse garlic and basil until finely chopped. Add tomatoes and pulse briefly. Do not purée the tomatoes, as the sauce is meant to be chunky or chop all by hand. Transfer to a medium bowl. Stir in the tomato paste, sugar, salt and pepper until well combined. Add more tomato paste if the sauce looks watery. Make the sauce a few hours prior to enhance the flavors. Refrigerated up to 4 days. 3 ounces (120g) pork pepperoni (preferably uncured). 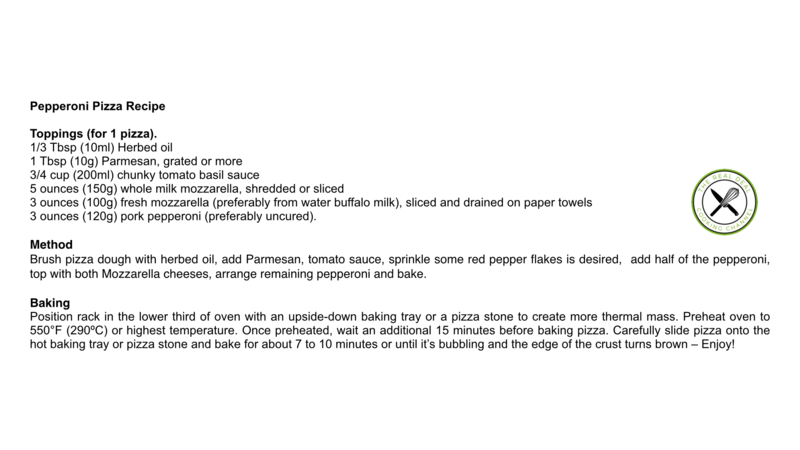 Brush pizza dough with herbed oil, add Parmesan, tomato sauce, sprinkle some red pepper flakes is desired, add half of the pepperoni, top with both Mozzarella cheeses, arrange remaining pepperoni and bake. Position rack in the lower third of oven with an upside-down baking tray or a pizza stone to create more thermal mass. Preheat oven to 550°F (290ºC) or highest temperature. Once preheated, wait an additional 15 minutes before baking pizza. Carefully slide pizza onto the hot baking tray or pizza stone and bake for about 7 to 10 minutes or until it’s bubbling and the edge of the crust turns brown – Enjoy!